1. What is the «Cool 45» plan? Digicel is pleased to announce the launch of a new plan entitled "Cool 45". This plan allows customers to make unlimited calls, offer them 1 GB for a price of 45 HTG and 2 minutes to make international calls (USA-Canada), valid for 24 hours. All prepaid customers are eligible (including the holders of a Ma Life SIM Card). 2. How to activate and check the bundles and validities of the «Cool 45» plan? The plan can be activated by dialing * 509 # send, * 500 # send and selecting "APEL + 1GB 45HTG" or by MyDigicel App. With Cool 45, customers can make Digi-Digi calls and also use Facebook / Whatsapp applications to send texts, videos, photos and voice notes, except for VOIP, unlimitedly for a period of time 24 hours. The Cool 45 plan is valid for 24 hours, customers can activate them as many times as they want during a day and this for the all duration of the plan. All prepaid customers can activate the Cool 45 plan via MyDigicel or by dialing the Code * 509 # send. Step 1. 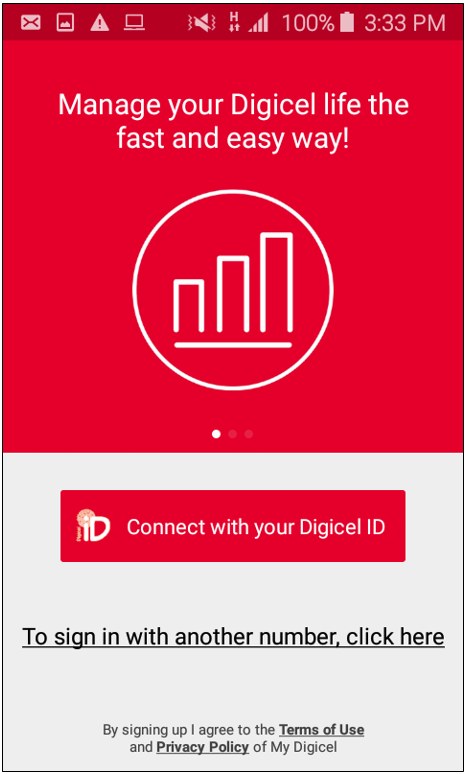 Click on 'Connect with your Digicel ID'. Step 2. Once connected to the application, select the 'Menu' button ( ) at the top left. In the Menu list, select « Plans » after « Available Plans». Step 3. Select «Cool 45». Step 4. Confirm the activation by choosing “Activate", wait for the confirmation message, and restart your device. Step 1. Enter the code * 509 # SEND, in the Numbered Menu, choose the plan « APEL+1GB 45G » with the appropriate number. Step 2. Confirm the activation of the plan with the appropriate number, wait for the confirmation message, and then restart your device.